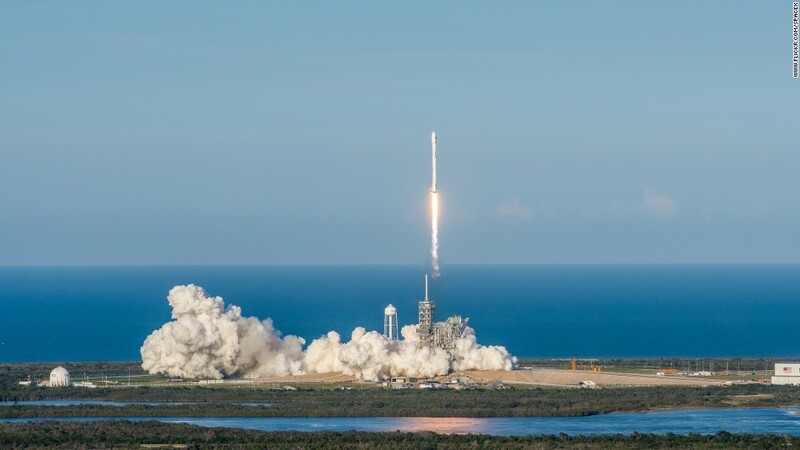 The pioneering company, headed by Tesla (TSLA) CEO Elon Musk, launched a Dragon spacecraft Saturday -- that was previously used in a September 2014 mission -- on another mission to resupply the International Space Station. SpaceX has proven it can reuse a first-stage rocket booster, which blasts the spacecraft toward orbit. But this is the first time it's reused the craft that actually goes into orbit. Before launch, the Dragon ship sits at the very top of SpaceX's Falcon 9 rocket and is designed to detach from the rocket once in space. It then ferries the cargo to the orbiting space station. This mission will mark SpaceX's 11th resupply missions to the International Space Station since 2012. The Dragon spacecraft used in Saturday's mission -- called CRS-11 -- is currently flying overhead, and it will meet up with the space station on June 4. If all goes well, a giant robotic arm attached to the space station will swing out to capture the Dragon as it flies by. Then, it docks with the station, where crew members on board can harvest its supplies. 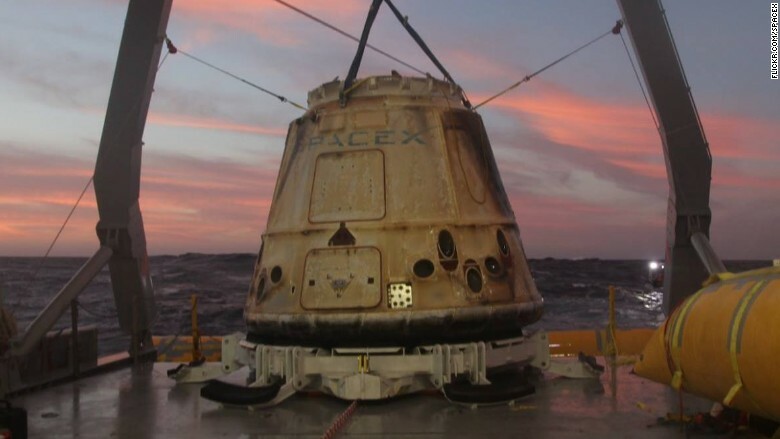 On this trip, the Dragon is carrying nearly 6,000 pounds of supplies -- everything from food for the crew to fruit flies and rodents that will be used in various experiments. The space station currently has three astronauts on board: two from the United States, and one from Russia. Two people -- cosmonaut Oleg Novitskiy of Russia and French astronaut Thomas Pesquet of the European Space Agency -- recently left the space station and returned to Earth on Friday after spending 194 days on board. Reusing a spacecraft isn't new. The NASA space shuttles, for example, made multiple trips to orbit. But the endeavor is a landmark for the growing commercial space industry. Traditionally, space travel has been the work of governments because corporations have been averse to the daunting risks and astronomical costs involved in space travel. But over the past decade-plus, SpaceX -- and a few other competing private space companies like Blue Origin, United Launch Alliance and Orbital ATK -- have upended that notion. Reusing a spacecraft also marks another huge step forward in SpaceX's efforts to bring down the cost of spaceflight. In March, SpaceX became the first company to launch, land and then reuse the first stage of an orbital-class rocket. Musk also said the company recovered at least a portion of the rocket's fairing -- a rocket add-on that can house satellites -- after that launch. The CRS-11 mission Saturday did not use a pre-flown rocket. NASA tends to be extra cautious about taking on added risks, though NASA ISS program manager Kirk Shireman said NASA is "working on" approving flights with used rockets. SpaceX did successfully guide the first-stage booster to a safe landing on a pad back at Kennedy Space Center, meaning that rocket may one day be re-flown. The art of recapturing a rocket after an orbital launch is one of SpaceX's signature moves, and it's done by no other rocket launcher. So far, SpaceX has landed first-stage rockets on land or remote-controlled bargest, called droneships, after 11 launches. The first-stage booster is the most expensive piece of the rocket, according to Musk, accounting for up to 60% of the rocket's $62 million sticker price. It's not clear how much SpaceX had to spend to refurbish the Dragon. But the company will undoubtedly save a significant chunk of cash by reusing it. SpaceX's Hans Koenigsmann said at a press conference Wednesday that the company is looking to make back some of the money it has poured into technology development. "We've invested a significant amount of money that we need to recover," Koenigsmann said.